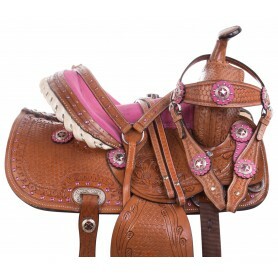 This adorable western saddle features pink accents and crystals on premium cowhide leather! Available in youth sizes 10" through 12" with matching headstall, reins, and breast collar for only $199.99 for a limited time only! This round-skirt barrel saddle is designed to provide comfort and performance for the serious barrel racer. 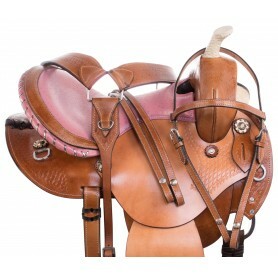 It features a two tone leather, extra deep pink ostrich padded seat, and pink ostrich trim on the cantle. 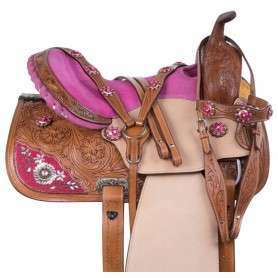 This adorable western horse saddle features pink accents and crystals on premium cowhide leather! Available in youth sizes 12" through 13" with matching headstall, reins, and breast collar for only $199.99 for a limited time only!